Once again, thank you to all the donors for the continued support. Your charitable donations will now allow us to purchase much-needed library and laboratory supplies. We’d like you to know that your thoughtfulness and generosity will make a significant difference in the lives of many Kenyan youth and that we are so appreciative of your support. We could have not done this without jumpstarting our project through MiddSTART! The project objective is to build a library in the summer of 2012 at Huruma slums, Nairobi, Kenya for New Dawn High School. This school was started with the aim of educating destitute children who would otherwise not have had an education. Ten Middlebury students have undertaken this project and Middstart will help kick start the first phase of the project — comprised of buying textbooks for the Library. The New Dawn Educational Centre (NDEC) serves students from the surrounding villages of Huruma, Githogoro and other surrounding informal settlements. The village of Huruma is proud of the school and supports and protects its efforts. The school serves the needs of the youth who are poor and/or orphaned. There are approximately 160 students in Form 1-4. Due to poverty, all students are on 95% scholarship. Kennedy Mugo ‘12.5, was one of the co-founders of the school in 2006, and taught there as Math and Chemistry teacher until he matriculated to Middlebury. Ten Middlebury students plan to fly to Kenya (summer of 2012) between June 1st and June 30th to build a library for the school. We are doing the fund-raising in three phases: first, procuring funds for buying books; second, procuring funds for purchasing shipping containers for the building structure; third, fund-raising for the furniture to be used in the library. Through Middstart we will fund the most important the first phase of the project: Book purchasing. We plan to have a blog where we the students will keep the donors posted on every step of the project. We will post video’s pictures and write about the whole experience. To reiterate what Otis has said, we have met our fundraising goals and will now continue to work on the logistics of the project until we depart! This includes assigning individual roles and projects to everyone involved while we are in Huruma to promote further education and equality within the community. We hope to do this through the arts with an after-school choir (led by Caroline, Shivs, and Helen), spoken word/slam poetry (led by Shivs and Fif), and a community mural to decorate the Library (led by Maya and Michaela). We will also target athletics by making a soccer clinic to promote community leadership and team building (led by Otis, Harry and Charlie). To update you on what has been going on so far, we have had a lot of successful events throughout our funding time period! This includes a fundraising dinner at 51 Main St. with live music and speeches. To view pictures from this event as well as others’, view the gallery on our new website (which also includes our other donations): http://www.indiegogo.com/Kenya-Library-2012. Upon our arrival home, Marty will edit the film and create a 45-minute to hour-long documentary about our time spent and the lives of those in Huruma. We hope to use this short film to educate the Middlebury community about the problems faced in the slums as well as continuing to spread awareness about the necessity of education in third world countries. Once again, thank you to all the donors for the continued support. Your charitable donations will now allow us to purchase much-needed library and laboratory supplies that will directly assist the beneficiaries of the program. We’d like you to know that your thoughtfulness and generosity will make a significant difference in the lives of many Kenyan youth and that we are so appreciative of your support. We have met our goal of $25,000 for the project — and exceeded it! The fund-raising phase for our project closes on Monday, April 16. The next phase, in anticipation of leaving for Kenya, will largely be the logistics of purchasing materials. Middlebury has been the largest donor to the project, with the Davis Grant being awarded to us, as well as funding the flights of team members. The remainder of the balance was fulfilled by personal contributions and donations. 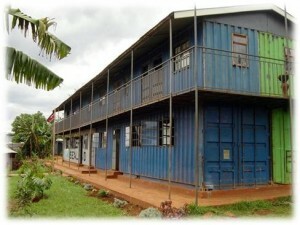 In addition, 8 shipping containers have been donated to New Dawn by a Danish couple. Mama Irene, co-founder of the school, was able to arrange for the shipping containers, which was excellent, and required the teams’ adaptability on the mission and planning. Previously allotted funds freed up by this donation will now be invested in a computer catalog system for the library as well as a chemistry and physics lab. As far as process, we now have additional students participating in the project, which has required some adjustments to organizing and managing the group. The senior leaders meet on Sunday nights and the full-team meets on Mondays. The team arrives in Nairobi in early June. We are very grateful for your continued support. Thank you so much for the generous contributions! Each and every one of us know that without your kind help, and many others’, this could not happen. We have moved our fundraising efforts to the website below so we can realize our goal of 25k: http://www.indiegogo.com/Kenya-Library-2012?a=449804. I want to congratulate you with your initiative. Education is the biggest favour you can do to the children in the deprived areas in Kenya. Have you thought about finding out whether there are other (private) donors who support education in Kenya. You may wish to do some research and see whether you can tap into some of these resources. Mugo and friends: this is a great idea! Thank you for doing this. My apologies for being out of the loop for this long, but I’m on board now. Great to hear that the books will be bought from Nairobi as well–letting the money that’s already for a good cause go into the local economy. Best of luck! We are deeply humbled by the generous donations so far! We have two more weeks to beat the deadline of Dec 17th and fully fund the “book buying phase” of the project–totaling $6000. Helping us beat the deadline would make an excellent christmas gift for the Huruma children. This is great initiative, several kids around the area will benefit from the good course!! We are deeply humbled the generous donations that have been made to us in the last couple of days, and would wholeheartedly want to thank everyone who has contributed to the Build a Library mission so far. We have gathered over $ 2,750 in the last 22 days. We need to raise another 3,250 in the next 23 days to complete the first phase of our project—comprising of buying books. I got the pleasure of knowing most of the Huruma children when I taught at the school, before coming to Midd, and I still remember how excited they got when I brought them a new book. They owned no books and had re-read the few books at the school numerous times. Any amount will go a long way. Happy Thanksgiving!! We did consider that at the beginning, but we found out that we would have to pay a substantial amount of duty at the Kenyan port. It would end up being more expensive compared to buying the books in Kenya. The bulk of the books we are buying are text books and would be purchased from book stores in Nairobi. Thank you for idea and support! Middlebury ’78: Have you considered accepting gifts of new/used books? If so, would you spec needed titles online? Nice to see your project. Education sure has come a long way since I attended!